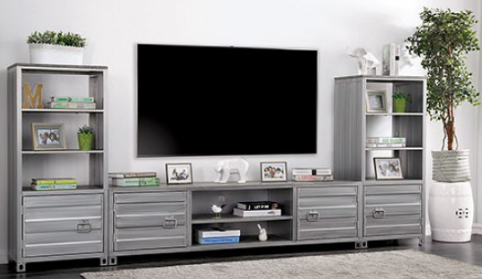 This television stand gives your media devices a perfect industrial inspired home. The metal panel cabinet fronts have a slight corrugated effect that offers a raw feel to the piece. You can fashion the rest of your living room in a similar style or offset the coarse materials with some lighter aspects. The choice is yours, although you're off to a strong start.